With over 1,300 staff in 48 locations across Washington State, King County Library System (KCLS) is the busiest library in the United States – circulating 22.4 million items in 2010. But like the old saying goes, “You can’t judge a book by its cover.” While KCLS continues to do an amazing job at inspiring and connecting the communities of King County, their IT infrastructure was a mess. 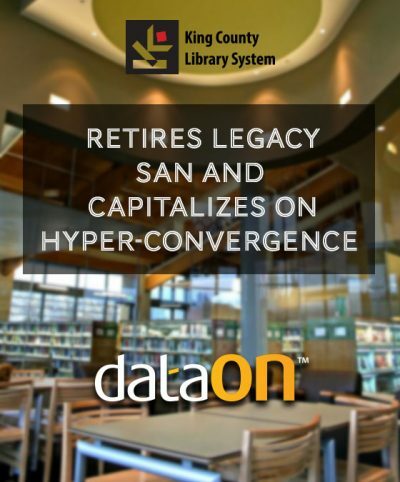 With rampant server sprawl and a near end-of-life SAN, they decided to consolidate everything into a hyper-converged solution with Storage Spaces Direct (S2D) and Windows Server 2016. “All of the big players… they only have a couple people that have any experience with Storage Spaces Direct. After meeting with DataON, we could easily tell they were experienced at deploying Storage Spaces Direct and we should be partnering with them,” said Eric Crew from KCLS. KCLS chose a DataON 5-node all-NVMe S2D solution to hyper-converge their data center. In doing so, they managed to reduce their hardware footprint by 10-15 servers while achieving over 2.1 million I/O per second (IOPS) across their 5-node S2D cluster.